Edwin Taylor (laborer); John B. Taylor (laborer). John B. Taylor (laborer); Judson Taylor (laborer). Edwin Taylor (porter); John Taylor (whitewasher). Edwin L. Taylor (waiter); John B. Taylor (whitewasher); Julia M. Taylor (teacher). John B. Taylor (laborer); Catharine V. Taylor (dressmaker); Edwin L. Taylor (Taylor & Wells). Francis Newton (sawyer); William M. Brown (waiter). William Neal (shoemaker); Francis Newton (laborer). Carrie Jones (domestic); Julia Jones (widow of Frank Jones). Francis F. [sic] Obold (builder). Francis S. Obold; Annie Tuohy. Sarah J. Obold (widow of Francis Obold); Annie C. Tuohy (widow). George W. B. Evans (clerk). Frank Mague (engineer); Maggie Bryerton (binder, Government Printing Office); Harry T. Clark; Russell Cyphers (machinist); Louis A. Radcliff (clerk). H. P. Andrews (clerk, Capitol); Charles Fisher (machinist); Charles Morris (clerk); John Renwick (clerk); David Tassler (Navy Yard); Louis A. Ratcliffe (clerk). John B. Kernshaw [or Kershaw] (machinist, Navy Yard); Louis A. Ratcliff (fire department); Maggie Bryerton (Government Printing Office); William S. Davenport (clerk, Treasury Department). Margaret U. Bryerton (Bureau of Printing); William S. Davenport (clerk, Treasury Department); Louis A. Ratcliffe (inspector, District Building). Margaret V. Bryerton (Bureau of Printing); Louis A. Ratcliffe (fire department). Austin J. Morgan (musician); Eugene L. Morgan (clerk); Margaret U. Bryerton (Bureau of Printing); Annette Castell (teacher); Nanette R. Castell (teacher); William S. Davenport (clerk, Treasury Department); William A. Gebicke (clerk); Louis A. Ratcliffe (Fire Department). Maggie Bryerton (Bureau of Printing); Carl Hookstadt (Library of Congress). Maggie Bryerton (Bureau of Printing); Louis A. Ratcliffe (Fire Department); Robert E. Schofield (Bureau of Printing). John A. Dorney (assistant, Library of Congress); Louis A. Ratcliffe (city fireman); Paul Ratcliffe (clerk, Newman’s Shoe Store, boards); Margaret U. Bryerton (operator, Bureau of Printing, boards); Carl Hookstadt (clerk, boards); James C. Mitchell (private secretary, Hon. J. J. Mitchell, boards); Owen Reese (page, boards); Edwin E. Witte (private secretary, Hon. J. M. Nelson, boards). Maggie H. Bryerton (operator, Bureau of Printing); William S. Davenport (clerk); Louis A. Ratcliffe (clerk). William S. Davenport (clerk); Albertine A. Bird (Library of Congress); John Ratcliffe (U.S. Army); Louis A. Ratcliffe (fire department). J. Paul Ratcliffe (clerk); Louis A. Ratcliffe (fire department); L. Johnson Ratcliffe (clerk, Department of Labor); William S. Davenport (clerk, Treasury Department). Johnson P. Ratcliffe (library, Department of Labor); Louis A. Ratcliffe (fire inspector). Mary Evans (cook); Fanny Berry (widow of Thomas Berry). Fanny Berry (widow of Thomas Berry); Mary Devlin (widow of John Devlin); Mary Evans (cook). James M. King (clerk, Treasury Department). Rev. Owen M. Miller (pastor, East Capitol Street Baptist Church); Nettie L. King (widow of James M. King); Lavina K. Collins (widow of William W. Collins). George F. Cunningham (machinist): James T. Cunningham (machinist); John T. Freeman (teacher). Ann D. Davis (widow of Addison Davis); Addison L. Otterback (baggagemaster); Louise B. Otterback; William H. Otterback (clerk, Post Office Department). Addison L. Otterback (conductor); Guy P. Otterback (clerk); Robert O. Otterback (lithographer); William H. Otterback (clerk, Post Office Department). Edwin Frey (clerk); Theophilus Gaines (chief of division, 3rd auditor). Fannie L. Berry (widow of Thomas B. Berry). Mary A. Bryant (widow of Samuel H. Bryant); Fannie L. Berry (widow of Thomas B. Berry). Fannie L. Berry (widow of Thomas Berry). Fannie L. Berry (widow of Thomas B. Berry); Mary A. Bryant (widow of Samuel Bryant). Grace A. Arth (clerk, Treasury Department); Hattie Arth (clerk); Joseph A. Arth (musician); Joseph F. Arth (druggist). Grace A. Arth (clerk, Treasury Department); Joseph A. Arth (musician). Claude R. Arth (clerk); Grace K. Arth (clerk); Joseph A. Arth (musician). Archibald L. Arth (clerk); Claude R. Arth (stenographer); Grace A. Arth (clerk, Treasury Department); Henrietta Arth; Joseph A. Arth (musician); Joseph F. Arth (druggist). Claude R. Arth (stenographer); Grace A. Arth (clerk, Treasury Department); Joseph A. Arth (musician). Frank A. Schaefer (clerk, boards); Harry M. Schaefer (page, boards); Michael D. Schaefer (chief clerk, construction and repair, Navy). Frank A. Schaefer (salesman, Carnegie Steel Co.); Harry M. Schaeffer (clerk, House of Representatives). Madeline Schaefer (bookkeeper, Underwood Typewriter Company); Michael D. Schaefer (chief clerk, construction and repair, Navy Department). Anthony M. Schaefer (clerk, Merchants Bank); Michael D. Schaefer. Anthony M. Schaefer (clerk); Edward Schaefer (page); Michael D. Schaefer. Anthony M. Schaefer (clerk); Madeline Schaefer (stenographer). Madeline V. Schaefer (clerk, Navy); Michael D. Schaefer. James R. Furgerson (plumber); Annie D. Middleton. Albert B. Clark (U.S. Navy); Harry G. Clark (lawyer); Mary F. Clark (widow of Rev. Albert Clark). Albert B. Clark (U.S. Navy); Harry G. Clark (lawyer). Mary F. Clark (widow of Albert B. Clark). Albert B. Clark (U.S. Navy); Harry G. Clark (lawyer); Mary F. Clark (widow of Albert B. Clark). Arthur E. Middleton (draftsman); Richard Middleton (inspector). Arthur E. Middleton (draftsman); Richard Middleton (clerk); Rose Poore (servant). Carrie J. Bryan (widow of Benjamin H. Bryan); Edward C. Bryan. Carrie J. Bryan (widow of Benjamin Bryan); Edward C. Bryan (clerk, National Museum). Carrie J. Bryan (widow of Benjamin Bryan); Edward C. Bryan (clerk, Fishing Commission). Martin M. Rohrer (real estate and loans); Benjamin H. Bryan (police); Edward C. Bryan (clerk). Benjamin H. Bryan (police); Carrie J. Bryan (widow of Benjamin H. Bryan); Edward C. Bryan (clerk, Fishing Commission). Benjamin H. Bryan (seaman); Carrie J. Bryan (widow of Benjamin H. Bryan); Edward C. Bryan (clerk, Fishing Commission); Martin M. Rohrer (lawyer). James A. Flemer (Coast and Geodetic Survey). John A. Flemer (assistant, Coast and Geodetic Survey); Lewis Flemer (Mackall Brothers & Flemer). Charles H. Flemer; John A. Flemer (assistant, Coast and Geodetic Survey); Ellen G. Matthews (teacher). Charles Flemer; John A. Flemer (assistant, Coast and Geodetic Survey). John A. Flemer (assistant, Coast and Geodetic Survey). Pearl S. Craig (clerk, Census Office). Annie K. Evans (clerk, District Commissioner [? ]); Francis H. Evans (clerk, Indian Office); George W. B. Evans (clerk). Francis C. Evans (clerk, Navy); Harry Irwin [sic] (clerk, Post Office Department). Emily Evans; Francis C. Evans (Commerce and Labor); Frank Evans; Harry Irion (civil service); Alfred H. Russler (boilermaker). Francis C. Evans (Commerce and Labor); George W. Evans (clerk); Mabel E. Evans (stenographer); Oscar Gardner (clerk); Harry H. Irion (civil servant); Clarence N. Walker (draftsman). Francis C. Evans (Commerce and Labor). John T. Shuman (painter); John T. Shuman, Jr. (clerk, boards). John T. Sherman [sic: Shuman?] (clerk, Woodward & Lothrop). John T. Shuman (painter); John T. Shuman, Jr. (clerk); Katherine Shuman (clerk). Christina Swain; John T. Shuman (clerk, Fred S. Lincoln, Inc.); Hallie Cooper (clerk); Jessie Jones. Hallie E. Cooper (clerk, War Department); Susuan Cossell (clerk, war risk). William J. Hussion (machinist, Navy Yard). Estelle S. Mead (correspondent, Veterans Bureau); Bessie A. Mayhall (clerk, Treasury Department); Ernestine R. Mayhall (clerk, Treasury Department). Eward Middleton (Rear Admiral, U.S. Navy); Francis Woodman (clerk, Post Office Department). George Hickenlooper (clerk, Paymaster General’s Office); Sarah Mason (servant). James W. Somerville (Thomas Somerville & Sons). ; Marcus L. Donohue (clerk). Edward Horn (cabinetmaker); Laura Horn (dressmaker); L. J. Kavanagh (clerk, Signal Office). David Rose; Frederick Roe (machinist). Cecilia Schriver (servant); Frederick R. Wallace (clerk); May S. Ashby. Annie M. Prescott (clerk, Census Office). Heber Gerow (manager); John R. Young (salesman). Edward K. Gerow (dentist); Heber Gerow (clerk); Ann King (widow of John King); William Mitchell (dentist); John R. Young (clerk). Emma M. Steckline (domestic); Frank H. Evans (clerk, Quartermaster General’s Office). Frank H. Evans (clerk, War Department). 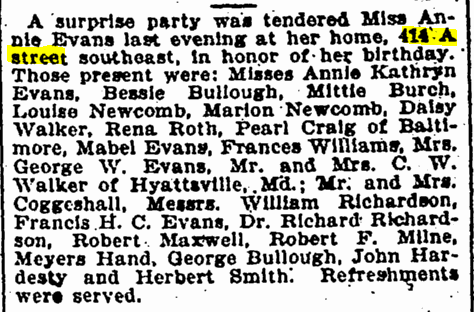 [*1903] Helen Bayly (widow of Harry Bayly); James McKnight (contractor); William A. McKnight (mason); William F. Tappan (printer). William F. Tappan (Government Printing Office); William A. McKnight (mason). William F. Tappan (clerk, Government Printing Office). Nellie G. Bayly (cashier); William A. McKnight (stonecutter); William F. Tappan (Government Printing Office). William F. Tappan (Government Printing Office). Harry Bayly (messenger); Helen G. Bayly (real estate); James A. Bayly (Library of Congress); William A. McKnight (stonemason); William F. Tappan (Government Printing Office). William F. Tappan (Monotype operator, Government Printing Office); William A. McKnight (stonemason, boards). William F. Tappan (Monotype operator, Government Printing Office). William A. McKnight (stonemason); Lois Wickham (clerk, Senate Office building). Margaret M. Tappan (Library of Congress); Mary S. Tappan (War Risk); William F. Tappan (Monotype operator, Government Printing Office). Margaret M. Tappan (Library of Congress); Mary S. Tappan (secretary, Veterans Bureau); William F. Tappan (Monotype operator, Government Printing Office). Lemuel B. S. Miller (clerk, Treasury Department). Lemuel B. S. Miller (clerk first auditor); D. F. McGowan (clerk, third auditor). L. B. S. Miller (lawyer); William E. Miller (conductor). E. V. Murphy (official reporter of debates, Senate). Charles W. Jones (Senator, Florida). Charles W. Havenner (Havenner & Dudley); C. T. Havenner (real estate); Henry B. Havenner (grocer); Pinkney B. Havenner (grocer). B. Charlton Havenner; E. Josephine Havenner; Estelle Havenner. George C. McPherson (clerk, Treasury Department); James Harper (printer); Martha Herd (servant); Charles D. Willard (lawyer). Clara M. Richter (clerk, Post Office Department). Ernest J. Sommer (Coast and Geodetic Survey); Margaret Walker (servant). Clara M. Richter (clerk, Post Office Department); Mary Richter (servant). Clara M. Richter (clerk, Dead Letter Office); Mary Miller (servant). Clara M. Richter (clerk, Dead Letter Office); Ernest J. Sommer (Coast and Geodetic Survey); Emilie Lange (servant). Ernest J. Sommer (Coast and Geodetic Survey); Mary Welz (servant); Clara M. Richter (clerk, Dead Letter Office). Ernest J. Sommer (draftsman); Clara M. Richter (clerk, Dead Letter Office). Ernest J. Sommer (Coast and Geodetic Survey); Clara M. Richter (clerk, Dead Letter Office). Ernest J. Sommer (Coast and Geodetic Survey). Ernest J. Sommer (topographer); H. Otto Sommer; Clara M. Richter (clerk, Dead Letter Office). Ernest J. Sommer (Coast and Geodetic Survey); Miss C. M. Richter (principal clerk, Foreign Division, Post Office Department). Miss C. M. Richter (principal clerk, Foreign Division, Post Office Department); Ernest J. Sommer (Coast and Geodetic Survey). Ernest J. Sommer (Coast and Geodetic Survey); H. Otto Sommer (student); Julius G. Sommer (student); Clara M. Richter (clerk, Post Office Department). Ernest J. Sommer (Coast and Geodetic Survey); H. Otto Sommer (physician); Julia G. Sommer (student); Karl E. Sommer (electrical engineer); Miss C. M. Richter (principal clerk, Foreign Division, Post Office Department). Clara M. Richter (clerk, Post Office Department); Ernest J. Sommer (Coast and Geodetic Survey). Theodore Straub (clerk, Census Office); Frank A. Flower (clerk, Census Office). Frank A. Flower (clerk); John B. Webb (clerk). William L. Agnew (printer, Government Printing Office). Records of the Past (bimonthly magazine; business address). Records of the Past (bimonthly magazine; business address); Thomas F. Nelson (vice president, Records of the Past Exploration Society); Frederick B. Wright (secretary). Thomas F. Nelson (genealogist; business address). Mrs. Betty Shinn (telephone operator). Thomas W. Walsh (secretary to the Hon. Andrew J. Montague). Annie Free (clerk); Clara L. Free (clerk); Charles Weedon (salesman, J. C. Weedon & Co.). Charles Weedon (salesman, J. C. Weedon & Co.). Frank M. Porch (lawyer and special agent, National Surety Co.); Clara P. Bateman (clerk, Post Office Department). Orpha E. Austin; Clara P. Bateman (clerk auditor, Post Office Department); Ambrose H. Chase (editor); Harold W. Porch (Library of Congress); Frank M. Porch (lawyer and special agent, National Surety Co.). Orpha E. Austin (clerk); Ambrose H. Chase (proofreader). Ambrose H. Chase (copyholder, Government Printing Office); Clara P. Bateman (clerk auditor, Post Office Department). Andrew H. Chase (journalist); A. H. Chase (Government Printing Office); John F. Bethune (clerk); Albert H. Votaw (Johnson-Wynne Co.). Ambrose H. Chase (journalist and editor); John F. Bethune (secretary); Maurice F. Fitzgerald (compositor). John F. Bethune (secretary, Capitol); Ambrose H. Chase (Government Printing Office). Adelaide Sutherland (clerk); Lloyd E. Stonnell (inspector). Eugene T. McCarthy (police); Elizabeth B. Donehoo (clerk, Post Office Department). Emery P. Crandall (locksmith, House of Representatives); Floyd M. Crandall (musician, boards); Vern O. Crandall (clerk, Washington Gas Light Co., boards); John F. McGarry (hallman, boards); Eugene T. McCarthy. Vern O. Crandall (clerk); Julia Osborn; Mrs. Mary E. Osborn. Boyd M. Crandall (student); Claude Crandall (jeweler); Emory Crandall (locksmith); Vernon O. Crandall (clerk, Washington Gas Light Co.). Laurette Murphy (clerk); Jean Jackson (secretary); Frances H. Jackson (widow of Delos Jackson). Ruth Spicer (clerk, War Department); Marguerite Evans (adjuster, war risk). Eugene T. McCarthy (clerk, Sanitary Grocery Co.); Vera Walter (clerk, War Department). Washington Evening Star, 13 February 1903, p. 6. “Social Matters.” Washington Evening Star, 2 July 1901, p. 5.